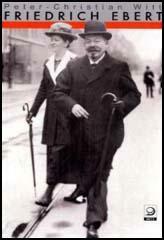 Friedrich Ebert, the son of a tailor, was born in Heildelberg on 9th November, 1871. He worked as a saddler and was eventually converted to socialism. Ebert became a journalist and found work with the left-wing Bremer Volkszeitung. During this period he also joined the Social Democratic Party (SDP). At that time the SDP was led by August Bebel and Wilhelm Liebknecht. After the anti-socialist law ceased to operate in 1890, the SDP grew rapidly. However, the leadership had problems with divisions in the party. Eduard Bernstein, a member of the SDP, who had been living in London, became convinced that the best way to obtain socialism in an industrialized country was through trade union activity and parliamentary politics. He published a series of articles where he argued that the predictions made by Karl Marx about the development of capitalism had not come true. He pointed out that the real wages of workers had risen and the polarization of classes between an oppressed proletariat and capitalist, had not materialized. Nor had capital become concentrated in fewer hands. Bernstein's revisionist views appeared in his extremely influential book Evolutionary Socialism (1899). His analysis of modern capitalism undermined the claims that Marxism was a science and upset leading revolutionaries such as Vladimir Lenin and Leon Trotsky. Paul Frölich has argued: "The SPD divided into three clear tendencies: the reformists, who tended increasingly to espouse the ruling-class imperialist policy; the so-called Marxist Centre, which claimed to maintain the traditional policy, but in reality moved closer and closer to Bernstein's position; and the revolutionary wing, generally called the Left Radicals (Linksradikale)." Ebert was a follower of Eduard Bernstein, whereas members of the Left Radicals, included Rosa Luxemburg, Clara Zetkin, Karl Liebknecht, Franz Mehring, Karl Radek and Anton Pannekoek. His power increased in 1905 when he became Secretary-General of the Social Democratic Party. Soon afterwards he stated that "I hate revolution like mortal sin." 1912 Ebert was elected to the Reichstag. The chairman of the SDP, August Bebel, died following a heart attack on 13th August, 1913. Ebert now replaced him as leader of the party. Like most socialists in Germany, Ebert was initially opposed to the idea of the country going to war. However, once the First World War had started, he ordered the SDP members in the Reichstag to support the war effort. Karl Liebknecht now joined with Rosa Luxemburg, Leo Jogiches, Paul Levi, Ernest Meyer, Franz Mehring and Clara Zetkin to establish an underground political organization called Spartakusbund (Spartacus League). The Spartacus League publicized its views in its illegal newspaper, Spartacus Letters. Liebknecht, like the Bolsheviks in Russia, began arguing that socialists should turn this nationalist conflict into a revolutionary war. In May 1915, Liebknecht published a pamphlet, The Main Enemy Is At Home! He argued: "The main enemy of the German people is in Germany: German imperialism, the German war party, German secret diplomacy. This enemy at home must be fought by the German people in a political struggle, cooperating with the proletariat of other countries whose struggle is against their own imperialists. We think as one with the German people – we have nothing in common with the German Tirpitzes and Falkenhayns, with the German government of political oppression and social enslavement. Nothing for them, everything for the German people. Everything for the international proletariat, for the sake of the German proletariat and downtrodden humanity." Rosa Luxemburg argued that it was important to stop the First World War through mass action. This brought her into conflict with Lenin who had argued that "the slogan of peace is wrong - the slogan must be, turn the imperialist war into civil war." Lenin believed that a civil war in Russia would bring down the old order and enable the Bolsheviks to gain power. Luxemburg and Leo Jogiches took the side of the Mensheviks in their struggle with the Bolsheviks. As a result Lenin favoured the Polish section led by Karl Radek over those of Luxemburg. On 1st May, 1916, the Spartacus League decided to come out into the open and organized a demonstration against the First World War in the Potsdamer Platz in Berlin. One of those who attended reported: "It was a great success. At eight o'clock in the morning a dense throng of workers - almost ten thousand - assembled in the square, which the police had already occupied well ahead of time. Karl Liebknecht, in uniform, and Rosa Luxemburg were in the midst of the demonstrators and greeted with cheers from all sides." Several of its leaders, including Liebknecht were arrested and imprisoned. Ebert called for a defensive, rather than an offensive war. With the formation of the Third Supreme Command, in August, 1916, Ebert's political power was undermined. Other members of the SDP also began questioning the policies of Ebert and in April 1917 they formed the Independent Socialist Party. Members included Kurt Eisner, Karl Kautsky, Julius Leber, Rudolf Breitscheild and Rudolf Hilferding. For the next two years Ebert continued to call for peace negotiations with the Allies. When Erich von Ludendorff returned power to the Reichstag in September, 1918, Prince Max von Baden invited Ebert to join the German government. Erhard Auer was made Minister of the Interior. Kaiser Wilhelm II was forced to abdicate on 9th November, 1918. He fled the country with the rest of his family and lived in Holland for the rest of his life. Prince Baden also resigned and Ebert became the new head of the government. At a public meeting, one of Ebert's most loyal supporters, Philipp Scheidemann, finished his speech with the words: "Long live the German Republic!" He was immediately attacked by Ebert, who was still a strong believer in the monarchy and was keen for one of the his grandsons to replace Wilhelm. Paul Frölich has argued: "The enemies of the revolution had worked circumspectly and cunningly. On 10th November Ebert and the General Army Headquarters concluded a pact whose preliminary aim was to defeat the revolution. During that month there were bloody clashes between workers. During this month there were bloody clashes between workers and returning front-line soldiers who had been stirred up by the authorities. On military drill-grounds special troops, in strict isolation from the civilian population, were being ideologically and militarily trained for civil war." "Who are these two fellows they've put on my back?" On 29th December, 1918, Ebert gave permission for the publishing of a Social Democratic Party leaflet. "The shameless doings of Karl Liebknecht and Rosa Luxemburg besmirch the revolution and endanger all its achievements. The masses cannot afford to wait a minute longer and quietly look on while these brutes and their hangers-on cripple the activity of the republican authorities, incite the people deeper and deeper into a civil war, and strangle the right of free speech with their dirty hands. With lies, slander, and violence they want to tear down everything that dares to stand in their way. With an insolence exceeding all bounds they act as though they were masters of Berlin." The following month Friedrich Ebert was elected as President of the new German Republic. Ebert selected Philipp Scheidemann as Chancellor and although the SDP was the largest party in the Reichstag, Ebert attempted to obtain national unity by appointing ministers from other parties. Threatened by revolution from both political extremes, and having to deal with the severe economic crisis brought about by the harsh terms of the Versailles Treaty, Ebert found running Germany extremely difficult. In March 1920, Herman Ehrhardt, a former naval commander led a group of Freikorps soldiers to take control of Berlin. Ehrhardt was protesting against the decision by Friedrich Ebert and his government to accept the Treaty of Versailles. A leading right-wing politician, Wolfgang Kapp, accepted Ehrhardt's offer to form a new government. The Kapp Putsch failed to win support from the German Army and was brought to an end when the trade unions in Berlin called a general strike. 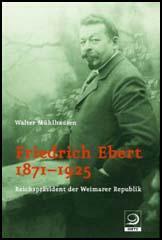 Friedrich Ebert remained in office until his death on 28th February 1925, aged 54, from untreated appendicitis. On his death he received this tribute from Gustav Stresemann: "I have spoken before of the loss we have sustained in losing a man who might well have been the instrument of a great work of reconciliation in Germany. To me his loss seems the heaviest because such reconciliation is so sorely needed." I have spoken before of the loss we have sustained in losing a man who might well have been the instrument of a great work of reconciliation in Germany. To me his loss seems the heaviest because such reconciliation is so sorely needed. The old Germany and the new ought not to be permanently opposed; the Reichsbanner and the Stahlhelm should not for ever face each other as antagonists. Some means must be found of fusing the old and the new. And the dead man would certainly have been one of those who would have set themselves wholeheartedly to such a task. The reserve with which we formerly regarded the President, which had indeed already been broken through by the impression of his conscientious labours, vanished on that August 11th when the President made up his mind to raise the Deutschlandlied above the turmoil of Party strife and restore it to its place as the song of the Germans. Let us not underestimate such a symbol. We wave flags enough against each other. It would be a pity if we tried to sing each other down! Thus we have at least a national song that unites all Germans, and is the symbol of our sixty-million nation. The enemies of the revolution had worked circumspectly and cunningly. On 10th November Ebert and the General Army Headquarters concluded a pact whose preliminary aim was to defeat the During that month there were bloody clashes between workers. During this month there were bloody clashes between workers and returning front-line soldiers who had been stirred up by the authorities. On military drill-grounds special troops, in strict isolation from the civilian population, were being ideologically and militarily trained for civil war.